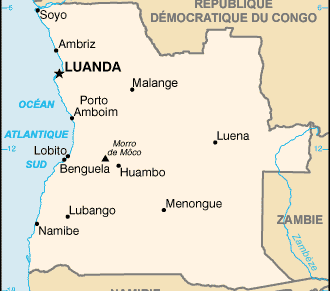 Angola : When and where to go? The country suffers from severe extremes in temperature. Rain is more frequent in the north which has a tropical climate with a dry season from June to September. The coastal plains are dryer. The rainy season runs from November to April: The rain is generally heavy at this time so resulting in flash floods making roads nearly impassable and even provoking serious problems at times. The dry season is therefore a far better time to visit the country. Following the civil war in 2002, Angola is far from returning to a sought after tourist destination: Anti-personnel mines, rising criminality, hold ups and carjacking are everyday problems. There is also very little in the way of a tourism infrastructure. However, there is no lack of magnificent natural sites to discover as well as some very interesting colonial forts. The Capital, Luanda, has some very beautiful churches, a history museum and a zoological museum. The Duc de Bragance falls are spectacular too. Certain grottoes possess rock art paintings that are a delight to discover. We can only hope that the situation will improve so that Angola can gradually open its doors to tourism. The currency here is the kwanza (impossible to import or export). No visas are issued nowadays; to enter Angola you need a temporary work visa as well as providing a guarantee of resources and lodging with an official letter from your sponsoring organisation in Angola. Also, entry into Angola is only by air. Within the country, travel by road is strongly advised against. Concerning health, it is advisable to protect yourself against malaria and be vaccinated against yellow fever, typhoid fever and hepatitis A and B. You should also avoid drinking tap water, using ice cubes, drinking fresh fruit juice and eating unpeeled fruit and vegetables. A thorough wash of your hands is recommended before eating. Be aware of the risks of cholera and AIDS that exist here. For security reasons keep a copy of your identity papers on you.